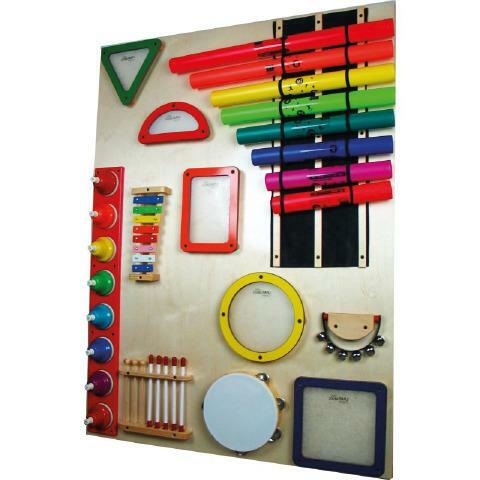 Percussion Junction Wall Panel is our newest interactive wall and the only one on the market that is all musical. This bright colors draw you to this unique wall. Make music yourself or with a friend. Listen to the different sounds each instrument makes. Percussion Junction Wall includes: Boomwackers, Sound Shape Pack Drums, Tambourine, Sleigh Bells, Xylophone, and C Scale Pat Bells. All mallets are right on the wall for convenience. Sensory Benefits: Visual, Auditory, Tactile, Motor. This is a full sized wall that mounts flush to your wall. Installation is easy and instructions are included. THE LEAD TIME FOR THIS ITEM IS CURRENTLY 12 WEEKS DUE TO HIGH DEMAND. This is a truck shipment. Shipping cost is for tailgate only. Please contact us if you do not have a loading dock. Dimensions: W: 36" x H: 48" x D: 6"
Warning: Choking Hazard (1) Not for under 3 years; Use with adult supervision at all times.